Going from 1 to 10 gives your skin 90% protection. Going from 1 to 30 gives your skin 97% protection. Going from 1 to 60 gives your skin 98% protection. Thus, although an SPF of 60 may seem "twice as good" as an SPF of 30, it is adding only 1% more protection. The formula that translates SPF to protection is simply 1 - 1/SPF. The figure at the top of the post plots the relationship. The upshot of this for sunscreen users (see this post at Webmed): Buy 30 SPF sunscreen, because it blocks 97% of the sun, and then take the money you saved by avoiding high priced, high SPF sunscreen to buy more of it so that you can reapply it often. The biggest problem with people's use of sunscreen is not the SPF number they buy, but the fact that sunscreen does wash off due to sweat, swimming, etc., and is not reapplied often enough. allowing sunscreens that are above SPF 15 and that block both UVA and UVB rays to be labelled "broad spectrum"; those that fall short of these criteria must have a skin cancer warning. requiring that sunscreen products that have SPF values higher than 50 be labeled as “SPF 50+” because the "FDA does not have adequate data demonstrating that products with SPF values higher than 50 provide additional protection compared to products with SPF values of 50." This latter change is a way of keeping consumers from being too impressed by large SPF numbers that are essentially meaningless. 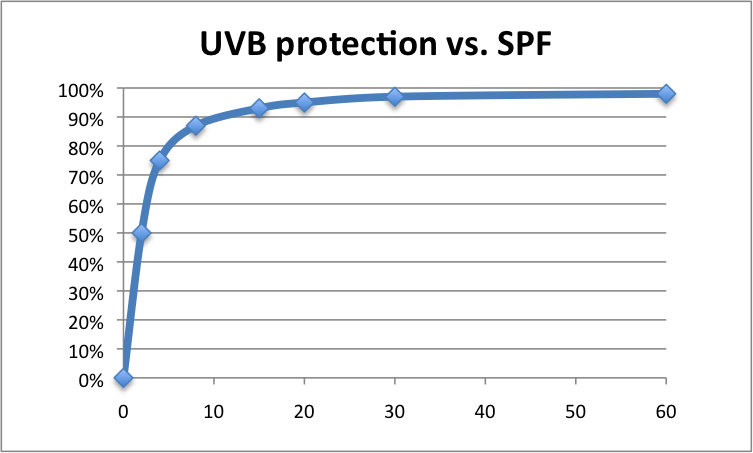 An alternative strategy would be to replace SPF with an inverse measure that captures "skin protection." But this could raise it's own dangers. Perhaps the FDA was worried that if sunscreen were labelled 90%, 97%, and 98%, people would too easily settle for 90%--it sounds good enough.